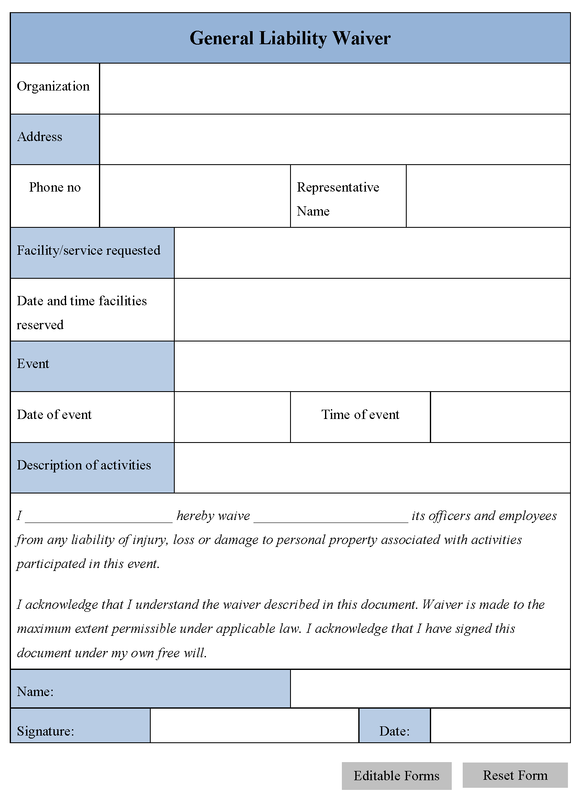 You can Download the General Liability Waiver Form post; customize it according to your needs and Print. General Liability Waiver Form is either in MS Word and Editable PDF. General liability waiver form is a document that an organization or a business uses to protect itself from any lawsuit. People who are working in the organization need to sign this form by saying that the organization is not liable for any of the injuries, damages or loss suffered from any of the activities that the person participates in with the organization. Also, General liability waiver form states that the person thoroughly understands the risks inherent in participating in any kind of activity. Usually, this waiver form also includes the basic information about the medical procedures that the organization may use in case of any emergency. Usually, organizations take people to trips, whether they are short or long that needs each participant to sign the General liability waiver form. For example, some kind of training programs asks its students to sign the form in case any risk involved in the program and organizers of certain type of adventures may want the thrill seekers to sign the form before they participate in any adventure. The protection of an organization through General liability waiver form depends on the laws in its particular jurisdiction. In some places, if the child is insisted to sign the form, the court may have full authority to overrule it. In case the form execution is wrong or the person can prove the court about the misunderstanding of the implications in the form, the judge can cancel the waiver. Also, if the person is suffered from any injury, loss or any kind of damage with the negligible acts of another person or anything related to the organization, then the organization is liable even it received a signed General liability waiver form.